What are fossil fuels and how were they formed? Click on the playlist to find out more about gas, energy and electricity. The method for creating energy shown in this clip is called "nuclear fission" - as mentioned on page 8 of your book. Click on the playlist to find out about other forms of renewable energy. Did you know Iceland is completely powered by nature? How can the ocean be used to make energy? Can you light a sports field using footsteps? What's a "fatberg" and can it be used to make fuel? Video may not work where you are due to BBC copyright restrictions. Discover glowing rocks, energy-generating balls - and more! We all need energy for our lives – and lots of it. 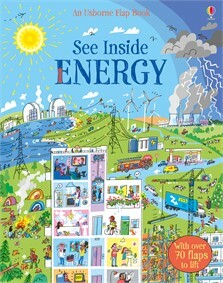 Find out what energy is, how it affects our planet and the exciting new inventions scientists are creating to make energy in the future, in this fascinating introduction to an important topic. With over 65 flaps to lift and links to specially selected websites to find out more.